Whether you’re an architect, engineer, into construction or mapping, your imagePROGRAF TX-2000 is your ideal ink-jet printer. Automated for convenience, it has the smarts to produce 24-inch CAD, GIS and poster graphics with excellent accuracy and speed. Dual rollers for flexible print and media options for weather resistance add to efficiency. Load two rolls of media then sit back and let your smart, wide format printer make the decisions about the best media to use for each job. Reproduce fine detail and text with incredible accuracy, even on economic uncoated paper and rest assured your weather proof prints can go anywhere. With a compact body, intuitive touchscreen, dual roll feeding and easy loading, your TX-2000 will fit into your office and get straight to work. With class-leading uptime, user friendly controls and impressive security for data transmission, storage and erasure, your TX-2000 is a top performer. 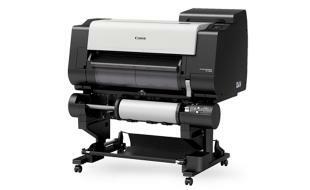 Interested in the Canon iPF TX 2000?